Midwest's Floods Aren't Over, But So Far, So Good : The Two-Way Sandbags have held back the cresting Mississippi River north of St. Louis. But from the Dakotas and Minnesota on south, there's growing concern about this spring's floods. 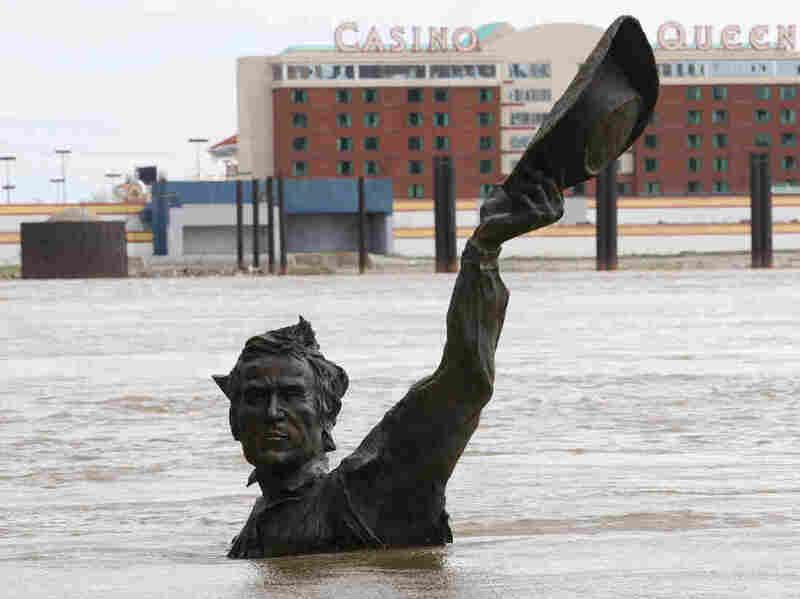 As the Mississippi River has risen in St. Louis, the city's Lewis and Clark statue has — as often happens in the spring — been partially submerged. The good news is that "the big river didn't get too big," The St. Louis Post-Dispatch writes this morning. "Sandbags held back the cresting Mississippi River from several towns north of St. Louis on Sunday," it adds, "while the forecast for the immediate vicinity remained high but manageable." But The Associated Press reports "there is growing concern that spring floods are far from over." According to the National Weather Service, "last week's rainfall is still keeping many rivers in flood stage across Illinois, Missouri, Iowa, Indiana and Michigan. Larger rivers, such as the Mississippi and Illinois rivers, will take longer to recede." So, as we reported Sunday, towns in Missouri, central Illinois and at least four other Midwestern states remain at risk. As St. Louis Public Radio said Sunday, the governors of Illinois and Missouri have declared states of emergency. Meanwhile, farther north, preparations continue for what could be some record high waters. "Flood preparations will move into high gear this week in the Fargo-Moorhead area," Minnesota Public Radio writes. "Construction crews and volunteers will build emergency sandbag dikes and earthen levees as the communities prepare once again for a possible record Red River flood."